One of the UK’s leading cardboard box manufacturers. Experience same day quotations, competitive prices, fast delivery and excellent service. Use our Free design service to reduce your packaging costs while ensuring your products are fully protected. Our Graphics designers create inspiring print layouts to present your company and products in the best way possible. Our sustainability policy guarantees we only use paper produced from fast growing softwood forestry which is managed and replaced. An advanced waste handling system ensures all production waste is recycled. Jaffabox have been cardboard box manufacturers since 1978. The company has continued to invest in people and the latest production machines and we currently operate from a modern 120,000 sq ft state-of-the art production facility close to the National Exhibition Centre Birmingham. 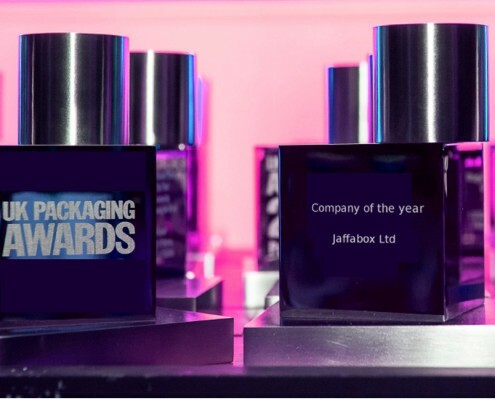 We are BRC accredited, renowned within the industry for quality and service, and are winners of the UK packaging company of the Year. With over 35 years of manufacturing experience we have a wealth of knowledge within the company. This ensures our customers always receive the best advice possible. Our engineering team maintain our machinery and vehicles to a very high standard to ensure reliability in meeting our customers delivery schedules. Own design manufacturing software systems produce same day quotations and efficient scheduling of production to make sure your boxes are delivered on time. Modern high-tech production line efficiencies guarantees we can produce quality products at very competitive prices.